Martin Marsick (Martin Pierre Joseph Marsick) was a Belgian violinist, teacher, and composer born on March 9, 1847. He created a scandal toward the latter part of his life as did Jean Marie Leclair at the very end of his. Thanks to a few of his students, he will forever remain in the history books, even if his name is not exactly the most remembered among violinists. These students included Bronislaw Huberman, Carl Flesch, George Enesco, and Jacques Thibaud. He is also identified with the violin David Oistrakh played from 1966 until the day he died – the Marsick Stradivarius of 1705. That violin ended up in the hands of Igor Oistrakh, but its present whereabouts are unknown to me. In 1854, seven-year old Marsick was admitted to the Royal Conservatory of Music in Liege (in other words, the Liege Conservatory.) He studied violin with a very obscure teacher named Desire Heynberg and graduated in 1864. Brahms was about 31 years old at the time. Marsick then continued his studies in Brussels with Hubert Leonard. Later still (1868) he went to Paris – which he made his home from that time forward - to study with Joseph Lambert Massart at the Paris Conservatory. He was 21 years old. Sponsored by the Belgian government, he went to Berlin in 1870 to study privately with Joseph Joachim. In 1871, he founded a string quartet – not an unusual thing to do for recently-graduated violinists. His debut took place in Paris in 1873. He then concertized in Europe and the United States for about 20 years. He was by then playing a Nicolo Amati violin from 1652, given to him by a member of the French nobility. Conductors with whom he frequently worked in Paris included Edouard Colonne, Jules Pasdeloup, and Charles Lamoureux. He also gave concerts with a piano trio which included Anatolyi Brandukov (teacher of Gregor Piatigorsky), and Vladimir de Pachmann (pupil of Anton Bruckner.) 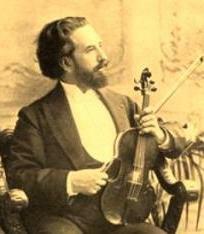 In 1892, Marsick was appointed professor of violin at the Paris conservatory. He was 45 years old. He stayed until 1900. In that year, he left his job, his students, and his wife and did not return until 1903. The woman he lived with during this brief time was married and the situation, which was widely known, created a scandal. It has been said that this incident ruined his career. In 1906, he published a study book for violinists entitled Eureka (Opus 34, 18 pages long) and another book (Violin Grammar) published in 1924. Perhaps these books are available in France. Thibaud did record at least one of his pieces (Opus 6, number 2, Scherzando) about one hundred years ago and that recording is still available. Among many other things, Marsick also composed three violin concertos, a quintet, a piano quartet, and a music drama. Whether these works are nowadays performed is unknown – I would guess probably not, except perhaps in France. According to some sources, Marsick died in poverty (in Paris) on October 21, 1924, at age 77. Marsick also owned a Domenico Montagnana violin from 1738 and a 1715 Strad which was eventually owned by Wolfgang Schneiderhan. Buy soccer jerseys online. Flytoshopping is offering soccer jerseys for men and women including brands. You can find barcelona soccer jerseys and nfl jerseys from the online store at any time. Martin Marsick is one of the greatest exponents of Violins.Really sad to hear he died in poverty.But he will be remembered as one of the true exponent of Violins. On February 7, 1896, Marsick played with the Boston Symphony - the work he played was Vieuxtemps' Fourth violin concerto. Unfortunately, his reception in the U.S. was not as warm as it had been in Europe. The Marsick Strad is now being played by Canadian violinist James Ehnes.